What are the most popular products on Swapit? What pre-loved items do people trade? Our most popular product category is Fashion followed by Mobile Phones & Tablets. From time to time I also get people telling me that they don’t believe there is a market for trading second hand goods in Hong Kong. Usually, those folks are more affluent clientele who personally would not consider purchasing anything second hand. Personal View. I for my part have a quite distinct view on pre-loved goods. Certain products I would absolutely and already did purchase second hand. My usual example is my daughter’s car seat and her crib, but also a baby gym, a bouncer, a jumperoo, a play pen, mobile phones & tablets (for testing), furniture, a car and property. Yet, there are certain things I do not consider purchasing second hand: mobile phones & tablets (for personal use), computer hardware and cameras & lenses. That’s mainly due to the fact that I buy the best gadgets I can afford. So they’re either so high-spec that no one has them nor sells them. Furthermore, if you pay a small fortune for the highest spec MacBook Pro with all upgrades you can get, you better make sure you get it with as much warranty as possible. Hong Kong View. The vast majority of local residents are inherently price sensitive. There is some part of Chinese culture that comes with a very distinct understanding of the value of money and that goes through all social layers. Yes, there are many young folks that go out all night, buy $50,000 bottles of champaign in a club (e.g. Boerl & Kroff Magnum), often spending their parents money, though. However, I reckon even they would haggle with you about $5 if you’d try to overcharge them for some soup noodles. Quality is important, but price efficiency and a good price-value ratio is very important too. So yes, the majority of our traders on Swapit are local Hong Kong residents. Some of them speak some English, but most communicate in Chinese. Luckily Swapit can separate items by language so it’s easy for us non-Chinese speakers. So while most of our traders are locals, it appears that trading second-hand goods is popular in Hong Kong. It is so popular, that we were actually able to collect a lot of data in that area and compile a great overview for everyone. Before we get to that, let’s look a little bit at some other aspects of trading. After Work Trading. Once people leave work, eat dinner and arrive at home, that’s the most popular time when they post new items on Swapit. At the same time, we see a constant stream of communication (chat messages and comments) during the course of the day, from morning to late. Of course, during night time there is quite a low engagement time because most folks are asleep. Signing Up During The Day. Sign ups of new traders usually happens during the course of the whole “awake” day. There is no particular time when more or less people sign up, so that’s quite interesting actually. Now let’s take a deep dive look at the popular product categories for second hand goods in Hong Kong. 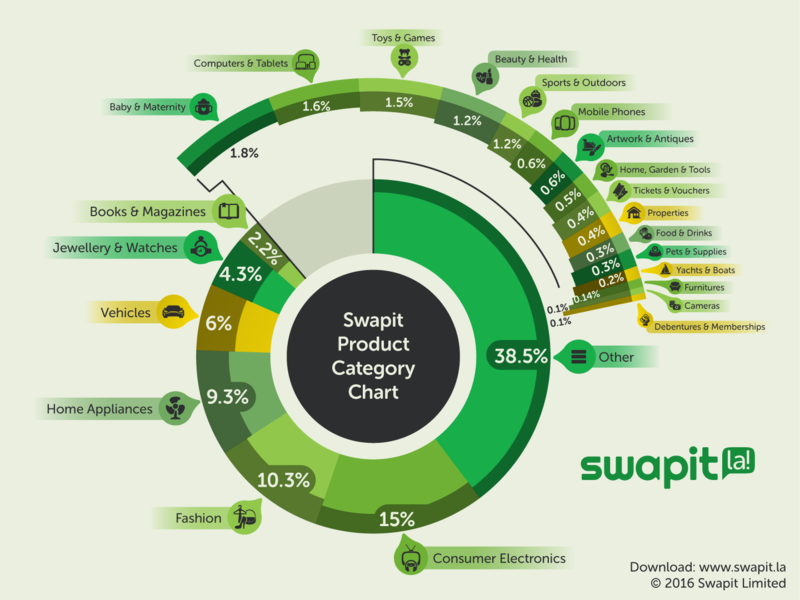 So in March 2016 the most popular product category on Swapit was Consumer Electronics followed by Fashion and Home Appliances. Fashion is particularly popular because we have a lot of fashionable female professionals using Swapit. They have great sense of fashion and like to trade dresses, shoes, hand bags jewellery and accessories. Consumer Electronics on the other hand is always a great product category. Mobile phones and tablets are popular nowadays and require an upgrade pretty much every year. The 1 year old devices usually still work fine and are in a decent condition. So it is just natural that their owners prefer to sell them to recover some of the cost of those devices. Overall, we’re very excited about the prospects of trading pre-loved goods — especially with people nearby. Swapit is the only app that offers this and we are working on bringing other great benefits to Swapit very soon. The chart above is based on the total number of items posted in March 2016 and put into relation to each other. Please note that the chart does not show the actual value posted in each category, but rather the number of items. We have also seen some people mistakingly posting their items in the wrong category which distorts the data a little bit. It is obvious in the chart above that the “Other” category has been heavily overused by many people even though chances to close a sale are much higher when posting an item in the correct category. Perhaps in a month’s time, we will look at the same data again and see how preferences for trading pre-loved goods in Hong Kong has changed. For now it seems to be very promising and the number of items on Swapit are rapidly growing every day. This entry was posted in our story and tagged categories, hand, pre-loved, research, second, second hand by Patrick Kosiol (swapitla). Bookmark the permalink.